A simple numbers and shapes wall, with some basic geometrical shapes and number chart till 100. The geometrical shapes were drawn on MS word, printed out in A4 sheets and simply crayon colored, and pasted on a Mahjong white paper (later pasted the white paper to wall), The numbers were printed out in A4 size papers, a 5x5 table on every A4 paper in landscape orientation. We drew a further margin to the table in the printouts, cut accordingly and pasted. The chart is pasted around the kid's eye level in the wall, for easy reading. 2. Mahjong paper - ~58cm X 58cm, white paper, popularly available in Singapore. Much thinner than chart paper. So one late evening, we made our first design together (was difficult for us to attempt individually 😄 ) - the angel fish, and needless to say, were hugely motivated by how it turned out. And since then, it became a hobby for the parents and the kid simply adored each of the models, be the innumerable simple ones - animal faces, aeroplanes or moving to intermediate levels - baby, sitting penguin, owl etc. Having done a decent range of background reading, we made use of different books for different models, depending on our comfort level and the ease of instructions. 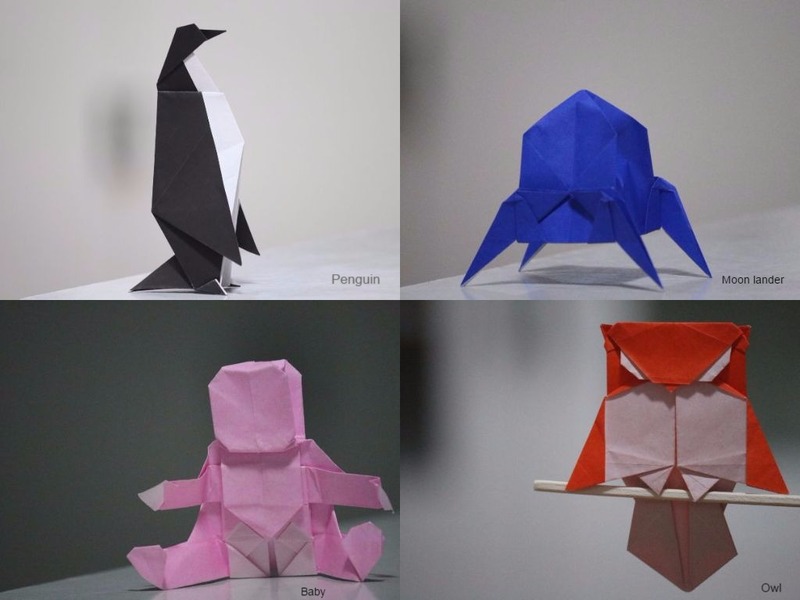 Traditional Origami does not involve any paper cutting, and we have followed the same in our attempts. After so many models simply lying around, we just thought of pasting them (at least those remaining and in decent shape) to a chart in the wall.. Was easy that way, logistic wise. Also updating the wall and snaps with some intermediate models and the references, as and when we finish the models. Double side tape - to paste it on the wall-chart. 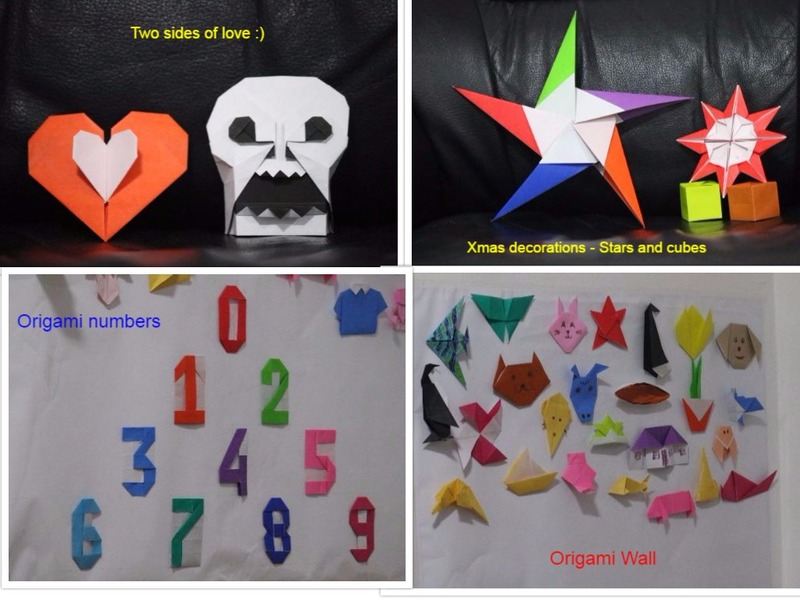 Just adding a snap of the updated Origami wall; however, could not paste most 3-D models on the wall. Robert J. Lang and Stephen Weiss, "Origami zoo : an amazing collection of folded paper animals". John Montroll, "Origami for the enthusiast : step-by-step instructions in over 700 diagrams : 25 original projects".